Picture of the Day: Dignity for an "Untouchable"
As an untouchable she was not entitled to own anything or to have any benefits or rights. But thanks to her parish priest and in collaboration with CNEWA, God has brought to her family a newfound dignity in being the actual owner of a new home, being built in the second picture. It is with a sense of gratitude that she invited me to see what was, block by block and bucket by bucket of cement, becoming her home. She, her husband and neighboring helpers and parishioners are the contractors and builders. A humble gift of $1,800 made all this possible. CNEWA is assisting in building five such houses. You can see her new home and read more about it, here. And you can follow all of Msgr. Kozar’s journey “In the Footsteps of St. Thomas” and read his daily blog postings from India here. NCR: What is the current situation at this time for Christians in Syria, who make up about 10 percent of the 2.5 million population? Bishara: The majority of Christians in Syria are not concentrated in one specific geographical area, but are rather dispersed all over the country, which makes their security situation more critical. However, at present and with only the exception of the Christians of Homs, the majority of Christians remained in their communities and in their homes. But as we knew from different sources related to the church, the Christian families started looking for a contingency plan consisting of finding a safer place for their families in case the uprising and the military events escalated all over Syria, with the same scenario as Homs. Christians in Syria are in a difficult spot because if they support the protestors, they could be targeted by Assad’s government forces, and if they support Assad, and his regime falls, they could be retaliated against by a new Islamist regime. So what are Christians currently doing during this conflict? During this conflict, the majority of church leaders from different confessions and rites expressed their concern toward the escalation and violence and the repercussions on the minorities, and called their communities to remain calm and to avoid taking sides in this conflict, whether against the regime or against the protesters. But the general feeling among the Christian communities is a deep concern based on the reality that where the Arab Spring has flourished, political life has become more fanatic and less tolerant of recognizing equal rights for Christians. Even Tunisia, where the former regime was based on a complete secular approach and tradition for more than 50 years, turned into an Islamic-dominated government, and just yesterday, large demonstrations there were calling for the establishment of a full Islamic state. Have Christians been specifically targeted by Assad and his government forces? No. On the contrary, the regime is still providing protection to the Christian communities in almost all places where the regime is still controlling the ground. But the problem occurred especially in Homs after the protestors and the Islamic groups had controlled a part of the city (Bab Amro Quarter) where around 200 Christians were killed. The other concern is related to terrorism, which can target anyone and any place and especially Christian military officers and their communities. The city of Damascus is important historically and has religious significance for Christians. The city has also been a city tolerant of religious minorities. Is this still the case or have things changed for the worse for Christians during this conflict? Damascus and Aleppo, the two largest cities of Syria, remained relatively well-secured and controlled by the Syrian regular forces, and all Christians in those cities are still enjoying their freedom and practicing their faith as regular. On Feb. 24-25, the ancient St. Virgin Mary Church was damaged in the fighting in Homs. Can you tell us more about that? St. Mary Church of the Holy Belt is located in the downtown of Homs, or what is so-called “the Old City,” and is considered the siege of the Syrian Orthodox Archdiocese of Homs. The majority of churches and Archbishoprics of other confessions are also concentrated in the same surrounding (Hamidiya, Boustan el Diwan, etc. ), and this quarter was subject to military confrontations between the militias and the government forces, and most of the time militiamen were using the churches and the Christians as shields to protect themselves from shelling. It is also important to mention that some icons inside the churches were damaged on purpose by the militias. With so much fighting going on, many people are leaving their homes in order to find refuge in safer areas. Is this the case with Christians, especially those Christians in and around Homs? If so, where are Christians going to seek refuge? Despite the difficulties of getting accurate statistics from the field, our updated information estimates that before the military escalations in Homs, the Christians used to number around 1,500 families (all rites). At present and after two weeks of the withdrawal of the militias from Bab Amro, the security situation is still very critical, especially with all the sniper fire on the civilians and the army on one hand and the acts of pillage on the other hand. A religious sister told us this morning that the 500 families who left their houses during the battle and found shelter in Tartous and Damascus found their houses and properties completely stolen or even confiscated. The families who decided to remain are in danger, are living in fear and poverty. Most of them cannot go outside their dwellings because of sniper fire, and of course none of them have any kind of income; the only reason they stay in Homs is to preserve their properties and because they have no other place to go to. There’s much more at the NCR link. 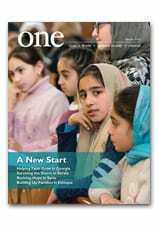 And you can read more about Syria’s Christian Valley in the January 2011 issue of ONE. In the case no parent or extended family member can care responsibly for a child, social workers now decide between two new government programs: foster care, in which the child is placed with a qualifying family, or a small group home, similar to the church-operated ones in Bediani. Typically, government-run group homes accommodate eight to ten children and two trained professionals. The government also encourages charitable organizations operating homes for homeless children and youth, such as Georgian Orthodox Church, to expand their services. Orthodox religious already have agreed to open group homes in Achara — a semiautonomous region in the country’s southwest — and other areas. The Catholic humanitarian agency Caritas Georgia (a partner of CNEWA) is one of several nongovernmental organizations that manage the government’s new small group homes. A leader in providing care to Georgia’s vulnerable children, it currently operates four government-built group homes. For more, read A Child’s Rights Restored. Check out the rest of the March edition on our website! So what have the first several months been like? I came onboard on Sept. 15, 2011, I had meetings with Msgr. Stern and then I had an intense week of meetings with key personnel. These meetings allowed for the big picture to be brought down a little bit and it allowed me to ask a lot of questions. I was only here one week when I hosted a plenary meeting with my international directors, which had been scheduled the year before. I really felt more than anything else that I was supposed to be here. When I connected the dots of my life, this was where I was supposed to be. We had five wonderful days of stepping outside the box in order that we all could look inside the box together. We are one CNEWA even though we have offices in eight different countries. We are one family, as we are one in Christ. “We were traditionally farmers, harvesting our olives and growing grain crops and keeping animals. But these days, very few of us Christians are involved in that kind of work. We have prospered and have received a good education, going to university in the towns, so we either work in tourism or are professional people,” she continues. Ms. Nehme’s generation is not the first to have left its rural roots: Her father is an electrician; her mother teaches at a local school. For more, read Syria’s Christian Valley. In Jerusalem's Church of the Holy Sepulchre on 18 March, a priest lights a candle in front of a picture of Coptic Orthodox Pope Shenouda III of Alexandria, Egypt. Pope Shenouda, who served as patriarch of the Coptic Orthodox Church for 41 years, died 17 March at the age of 88. Yesterday, I represented Cardinal Timothy Dolan at a prayer service celebrating the life of Pope Shenouda III, who died on 17 March after leading the Coptic Orthodox Church for more than four decades. I was warmly welcomed to the church of St. Mary in East Brunswick, New Jersey, by Bishop David, who leads the Coptic Orthodox Archdiocese in North America, and by many priests of the Coptic Orthodox Church, which has a number of parishes in the New York metropolitan area. I was especially made to feel at home by the youth — young men and women devoted to the memory of their deceased pope. The church — filled with images of the Sacred Heart, the Blessed Virgin Mary and the saints — was overflowing, a testimony to the love and the leadership of this dynamic man of God. In my remarks to the assembled faithful, I shared with them that, despite the reality of the dwindling numbers in our Christian families in the Western world, it was most uplifting to be present with so many committed young people. I learned that in all things, Pope Shenouda III was a devoted father and teacher. “A church without the youth is a church without a future,” he once said. “And the youth without the church are a generation without a teacher.” Despite being responsible for millions of Coptic Christians scattered throughout the globe, he never ceased to give weekly lectures from the Cathedral of St. Mark in Cairo, which drew millions of young men and women for decades. The papacy of Shenouda III marked an unprecedented expansion of the Coptic Orthodox Church, especially in North America, where there are now more than 200 parish communities in Canada and the United States. He also ushered in a revival of catechesis, focusing on the formation of youths, and Christian monasticism, which began in the deserts of Egypt in the early fourth century. Thank God for this loving servant of the church, and may the Lord bless the Coptic family, the spiritual sons and daughters of Shenouda III, and heal them in their time of grief. If anyone needs to know what it is like to live in a divided city like Jerusalem, a member of our CNEWA family can tell you. Joseph Hazboun remembers when he could hop into his car in Jerusalem and drive the few miles to the nearby West Bank city of Bethlehem to see his family. It was easy enough, even passing through mandatory checkpoints, that he and his Jerusalem-born wife and children would make the trip at least twice a month. It has been years, though, since the Hazbouns, who are Catholic, could make the 25-minute drive on their own. Now the family must take light rail, two taxis and walk across a checkpoint to get from their home in East Jerusalem to Bethlehem. The venture takes at least 90 minutes. The result: The Hazbouns have curtailed their visits to once every several months. Israeli laws on the book since 2003 strictly limit who can obtain permanent residency status and thus enjoy the related benefits, including driving privileges. The Supreme Court recently upheld the law. Although he is the spouse of a Palestinian resident of East Jerusalem who holds an Israeli permanent resident ID, Hazboun is prohibited from becoming a permanent resident of Israel because he is from Bethlehem. Only those with permanent residency can enjoy benefits of Israeli society, including coverage under the health care system and social security benefits. Every year the couples keep close track of their rent receipts, utility bills, school tuition payments and vaccination records. They trek to the Ministry of Interior and then to the Civil Administration in the West Bank to get the piece of paper that allows them to live together legally as a family. They are among thousands of Palestinian couples who continue living in a state of limbo and uncertainty because they must apply for a temporary residence permit annually. “That puts us at their mercy as, at any given moment, they can rebuke our residency permit and tell us to go away somewhere. But I have nowhere else to go. Here is where my work is, here is where we have our home,” said Hazboun, 46, who has worked in the Jerusalem office of the Pontifical Mission for Palestine for 18 years. He has lived in the city since he married his Jerusalem-born wife, Rima, 17 years ago. There’s much more. Read the rest. And for more on life in Jerusalem, and throughout Israel, check out Msgr. Kozar’s posts on his Journey to the Holy Land, and for some history of the sacred city, read The Holy City of Jerusalem.